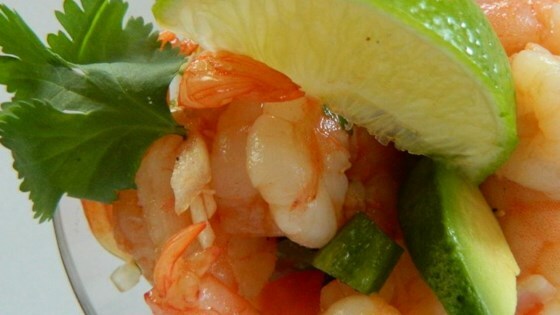 "Cooked shrimp are chilled in a spicy tomato-juice cocktail with avocado, red onion, and cilantro. Serve in one large bowl or ladle into individual bowls." Mix shrimp, red onion, habanero pepper, cilantro, jalapeno pepper, and garlic in a large bowl; add tomato and clam juice cocktail, lime juice, ketchup, horseradish, and hot pepper sauce and stir. Season mixture with salt. Gently stir avocado into the mixture taking care to not mash the avocado. Cover bowl with plastic wrap and refrigerate for 2 to 3 hours before serving. Excellent! Made exactly as directed except for Habanero because I didn’t have. Will definitely make this again. Better the next day so make night before or early in day if serving that night.